Welcome back to Toddler Approved Tuesday. Thank you for linking up last week, I can’t wait to see what fun you’ve been having with your little ones this week. We had fun yesterday with this Dandelion Playdough. Our garden is currently overrun by them and the Little Tots love picking them for me. My lovely co-host Becky has also been having fun with this Playdough Butterfly invitation to play. My favourite two from last week were both garden related and perfect for this time of year. Firstly I love this Growing Tuff Spot from Tuff Spot Play such a great messy and sensory activity for little ones with lots of lovely learning opportunities. I also loved this post from Handy Herbs – From Planting to Plate! 8 Important Reasons To Garden & Cook With Your Kids a great read for all parents. 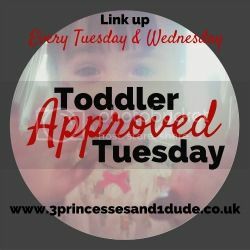 Come and link up below each Tuesday from 6am until 11:55pm on Wednesday and I’ll pick two favourites to showcase next week. Don’t have a blog? Then show us what you’ve been up to on Facebook, Instagram and Twitter using the #ToddlerApprovedTuesday.